For the moment, things are tough all over. No, I must be more accurate: things are Tough all over. Cousin Uwe is someone I embrace through this cyber-medium, even though we have never met. He is Sole Proprietor of a wonderful blog, SATCHMOTUBE — devoted to collecting and sharing performances of Louis Armstrong on film and television: http://satchmotube.blogspot.com/2010/05/pops-singt-italienisch.html. It’s a delightful blog. It makes me feel happy whenever I visit it. But why do I call Uwe “Cousin”? It srikes me more and more that we have Internet families — people we love and admire who send the same feelings back — who we might never meet in person. Thus Uwe has been taken into the Steinman entourage, whether he likes it or not! And maybe my ever-expanding jazz family will help me feel better about my dead father, someone whom I miss terribly as I write these words. He lives through me, and I hope he knows that. Jazz musicians give us so very much. And sometimes all they get back is our applause, thirty dollars at the end of the night, a burger, a beer. 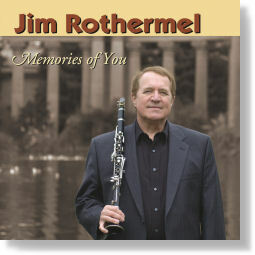 It seems to me that there ought to be a way to do better, especially in the case of reedman Jim Rothermel. As you may know, Jim Rothermel, the Golden Gate Rhythm Machine’s fabulous reed-man since 1984, has undergone almost 6 months of chemotherapy to combat acute leukemia. He has been accepted at Stanford Medical Center for a bone-marrow transplant as soon as an acceptable donor is found, probably early in 2011. Recovery from this procedure will take a number of months, possibly up to a year, during which time he will be unable to work or have any income at all. We are hoping this benefit will raise money for his support during his recovery period. Click here https://www.paypal.com/cgi-bin/webscr?cmd=_s-xclick&hosted_button_id=BJVUPK7HXLFGL to donate money for Jim: any amount will help! And if you distrust online transactions, the old-fashioned method will do nicely, Checks made out directly to Jim can be sent to him at Jim Rothermel, 14 Seibel Street, San Rafael, CA 94901. Think of the music — and of the people who so heroically create it for us!